On January 15, 1860, Daniel Ricketson of New Bedford wrote his good friend Henry David Thoreau at Concord describing the skating he enjoyed on the day following Christmas, 1859, in the company of his sons Arthur and Walton Ricketson. The trio made a long but pleasurable circuit of the Middleborough ponds. After this scene we again assumed our skates from the Assawamset shore, near by, and skated down to the end of the East Quitticus pond, the extreme southern end of the ponds; thence crossing to West Quitticus, we skated around it, which with the return from the south end of the former pond to our crossing place, we estimated at something over 15 miles. Taking off our skates we took a path through the woods, and walking about a mile came out in some old fields near our starting point. 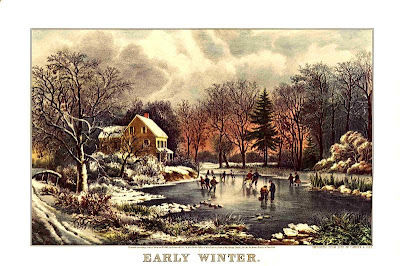 We put on our skates at 10.30 o'clock A. M., and at 3 P. M. were eating dinner at the old farm-house of William A. Morton, near the south shore of Long Pond. I expect to be in Boston at the annual meeting of the Mass. A. S. Society, near at hand, and hope to see you there, and if agreeable should like to have you return home with me, when, D. V., we may try our skates on the Middleborough ponds. We all spoke of you and wished you were with us on our late excursion there. Daniel Ricketson (1813-98), frontispiece from Daniel Ricketson and His Friends: Letters, Poems, Sketches, Etc. (Boston: Houghton, Mifflin and Company, 1902).